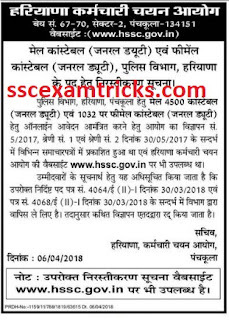 HSSC Haryana Police Constable SI Admit Card 2018 Advt 3/2018 Call Letter - HSSC Haryana Police Constable Online Form 2018 Advt 3/2018 Apply Online- HSSC Haryana Police Recruitment Cancel Notice - 5532 Constable (4500 Male/ 1032 Female) Recruitment Cancelled - Haryana Police Constable Admit Card 2017 Exam Date – HSSC Police Physical Test Call Letter 2017 - www.hssc.gov.in. 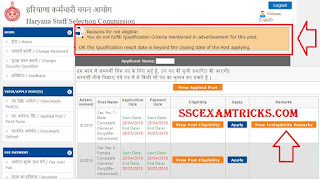 On 15.12.2018 - HSSC Constable Post Exam Admit Card has been available now. The link is given in the end of the page. On 05.12.2018 - Online Admit card for constable will be available on or after 15th December 2018. The news is that Haryana Staff Selection Board has all set to announced date of exam for the post of Constable and SI under Advt. 3/2018. The exam may be held in the month of September/ October 2018. The admit card will be available about a week before the date of exam. 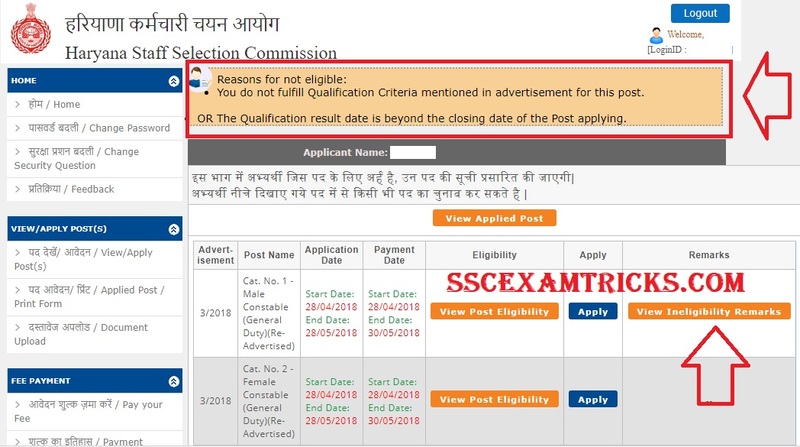 Haryana Staff Selection Commission has decided to re-open the application form on 20.06.2018 for those candidates who have left to fill online application form. This application submission will be closed on 02nd July 2018. Those who could not apply for last time can apply online on official website www.hssc.gov.in. Earlier the last date was extended from 30th May to 04th June 2018.
at 11:00am - Haryana Police last date has been extended now. 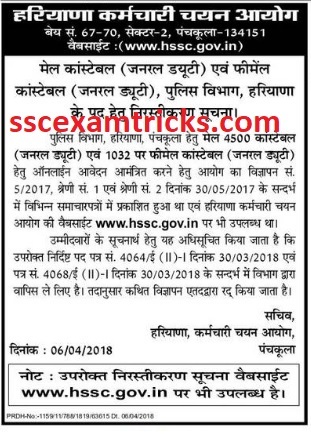 The new last date has become 04.06.2018.
at 09:00 am - HSSC Haryana Police Website is still opened and you can register as a fresh candidates on today. You have missed the last date, then you can apply right now. How long it may open or last date extended, it can not be said. The last date may be revised for the advertisement as the website was closed for few days (including last date). At 03:00pm - The website is working well - Apply Now - Don't wait for the last date - it may get busy in the last moment. Don't get panic for the payment of application fee. Now the payment issue has been generated on the official website. This issue may be solve automatically after 2-3 try. Keep trying and do your best. The bad news is that HSSC has moved under technical problem as it shows massage of ineligibility after applying for the post of Constable GD (Male & Female) Category No 1 & 2 on official website. However, you are quite eligible as you possess the requisite educational qualification and age required as per notification. Even after it shows the following massage. In this condition, don't panic. Keep calm. This problem may be sort out very shortly by the commission. The website is under technical problem while applying for the posts of Sub-Inspector (Female) candidates under Advt. 3/2018. It shows that you are not eligible and also showed reason (image above). Latest News (30.04.2018) - The link to Apply Online for Haryana Police Form 2018 has been activated now. Rest of the information are still same . Read notification for more info.
" उम्मीदवारों के सूचनार्थ हेतु यह अधिसूचित किया जाता है कि उपरोक्त निर्दिष्ट पद पत्र संख्या 4064/ इ (II)-I दिनांक 30/03/2018 के संदर्भ में विभाग द्वारा वापस ले लिए हैं | तदानुसार विज्ञापन द्वारा रद्द किया जाता है"
Haryana Staff Selection Commission has done preparation to conduct physical test which is expected to be organized in September/October 2017 at various venue across Haryana state. Haryana Police Physical Test Call letter is expected to be available about 7 days before the physical test date. HSSC will organized Physical Efficiency and Physical Standard test to shortlist candidates for written test. Those candidates who will qualify in the physical efficiency test (PET) and meet physical standard requirement will be called for written test. The date of written test will be announced after PET exam result. The various type of event will be organized in Physical Test of Male and Female candidates for Haryana Police Constable 2017. Previously, HSSC had invited application for submission from June-July 2017 on official website www.hssc.gov.in. The notification was published in February for recruitment of 5532 posts of Male and Female Police constables. Huge numbers of candidates had applied for these posts. Now, you are waiting for Haryana Police PET Admit card 2017. The online call letters and latest news can be read and download (respectively) from the page. 1. Go to the official website (address mentioned above) or click on the link given in the end. 2. Press ‘Click for Advt. 01/2017’. 3. 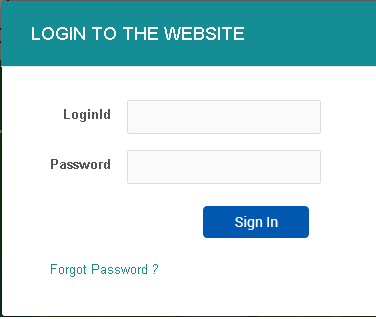 Click on ‘Login’ button and enter your login details (login ID and password). 4. Finally press on ‘Sign In’ button. Don't forget to bookmark www.sscexamtricks.com by clicking ctrl+d button. Stay tuned with us for getting latest updates. Feel free to ask your doubts or queries in the comment box.